Representing a long-term investment you can make for your hunting property, this trail camera will not bother you with too many headaches and problems down the road. It is an entry-level unit that comes at a premium price, which should not discourage you in any way to buy it since it offers what other units of a lower price can offer but will definitely outlast those cheaper cameras by the number of years you can have it installed in your property. Best for sites that do not have much foot traffic from people, this unit comes with awesome features that deliver immense possibilities. Easily ahead of its time, this trail camera features a latch that works flawlessly. The latch is made big and beefy so it is easy to pop open and snap shut. The housing keeps the elements out of the sensitive camera electronics enclosed inside, effectively preventing moisture and damage. This trail camera comes with a pre-form bracket built through it. Unlike brackets that are built on the outside of other trail cams, the bracket on this particular model goes through the device so it can’t be broken off easily by leveraging on the unit itself. Of course, you can always buy a security case to lock it down for more secure protection from bears or thieves that may stop at nothing to get the camera. This unit offers long term durability so you have fewer headaches and issues even for ten years of use. This camera features the renowned Reconyx picture quality, which makes the product truly special. Unlike other brands that use deceptive marketing gimmickry by touting their products to have high megapixel rating, this model will not deceive buyers and is honestly stated to only have 3.1 megapixel rating on images. However, the huge difference lies in the impressive quality of its exclusive Ultra HD IRTM camera lens, which enables the camera to come out with fantastic photos characterized by super crisp images, great color, exceptional clarity and overall unbelievable picture quality especially during the daytime. The camera also has stop motion technology so you are not going to end up with as many blurry images from a deer that quickly runs by or a mountain lion on the prowl. Although this model is not able to take videos, it offers awesomely quick photo capture so you can get full images of the game to give you an idea how big they are. 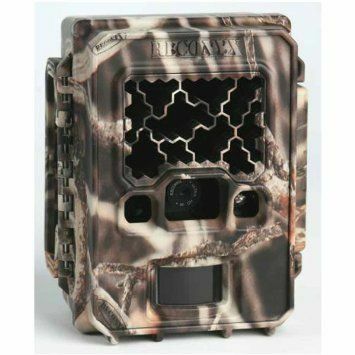 This trail camera has cutting-edge Lo-Glow infrared emitters that enable image capture without scaring the game off. It allows you to get plenty of photos that you can review and observe the animals with. The Rapid Fire near-video speed of up to two frames per second allows super quick photo taking in amazingly true high definition at 1080p resolution. The wide, 50-foot nighttime flash range ensures that the camera won’t miss anything. Producing color day images and monochrome night images, this trail camera imprints a time, date, moon phase and temperature stamp on all photos so you have accurate information when you are trying to get data on animal behavior patterns for planning your hunting activity. The fast ⅕-second trigger speed ensures that the unit won’t take long to snap a shot when movement is detected. This trail camera features an SD or SDHC card slot that accommodates a memory card up to 32GB so there’s always more than enough memory capacity to store captured photos, eliminating the need to regularly visit the trail camera while it is installed outside. Frequently visiting installed trail cameras results in imprinting your scent on the site, making the deer wary and eventually spooking them off. The included exclusive BuckView™ Advanced software for Windows with Google Maps® enables you to use GPS in locating the camera so you can track everything in your property. The CodeLoc® pass-code protection ensures that images are reserved for your eyes only so no one can piggyback on your camera investment. This is a US-made product that ensures you of premium quality and dependable craftsmanship. This trail camera offers options on power. It can be operated using six or twelve double-A alkaline batteries, or nickel metal hydride (NiMH) rechargeable ones, as well as 1.5-volt lithium batteries and can run continuously for up to a year. It operates at a temperature range between -20 degrees Fahrenheit and 120 degrees Fahrenheit to withstand the toughest conditions in the outdoors. The one-year limited warranty is your assurance of quality manufacture. The realistic camo pattern enables covert placement in any outdoor location.